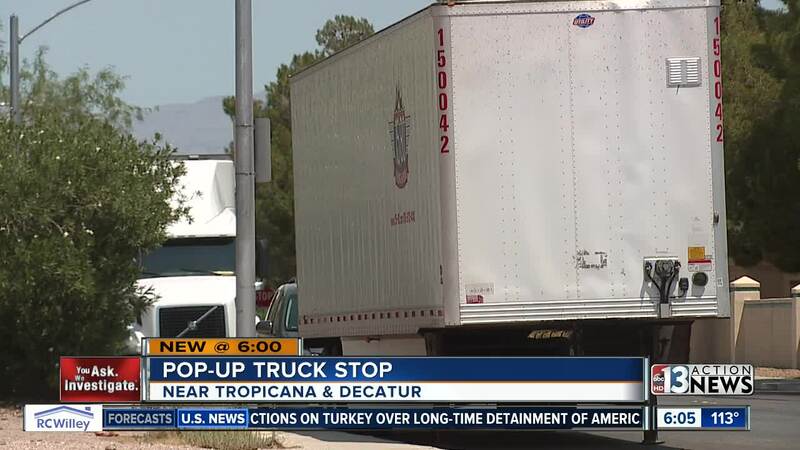 Some people say they are living next to a pop-up truck stop ever since semi trucks and trailers park illegally along a residential street near Tropicana Avenue and Decatur Boulevard. "This is terrible!" said Tori Clements. "I live right here and that's what I see everyday and every night," she added. The truck trouble has been around as long as Clements has lived in the area. "I keep my blinds closed, I don't want them looking into my windows," said Clements. The 4900 block of Edmond Street is lined by condominiums and apartments. According to Clark County records, the area is zoned R-3 or multi-family residential. "Every night they have the motors running, I hear them party," Clements said. She added, "It's just terrible, it's a nuisance." The noise and presence of the commercial vehicles could also present a potential danger. A Clark County spokesperson says the "no parking" signs along Edmond Street are up for a reason, typically because of the road design, safety, or some other necessary reason. Contact 13 also found it is against the law for commercial vehicles to park in a residential zoned areas in Clark County, unless it is "expeditiously engaged in the loading or unloading or merchandise or passengers" or in the area for construction or other necessary activity. Some residents report the trucks and trailers on Edmond Street have not moved in weeks, or even months. "No one will do anything about it," Clements said. "I guess the police, they're too busy, and the homeowners association says it's not their problem," she added. A Clark County spokesperson said the illegal parking is an enforcement issue to be handled by either the Las Vegas Constables Office or Las Vegas Metropolitan Police . Contact 13 has alerted both agencies.